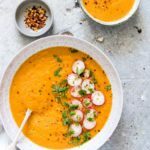 Instant Pot Detox Soup is a healthy vegetable soup that is full of beautiful colour and flavour! This is a quick and easy soup that is both nourishing and satisfying. Perfect for getting back on track after an indulgent holiday season. Suitable for Vegan, Gluten-Free, Keto, Paleo and Low Carb recipes. Post includes Weight Watchers points. Looking for a great way to get back on track with healthy eating? 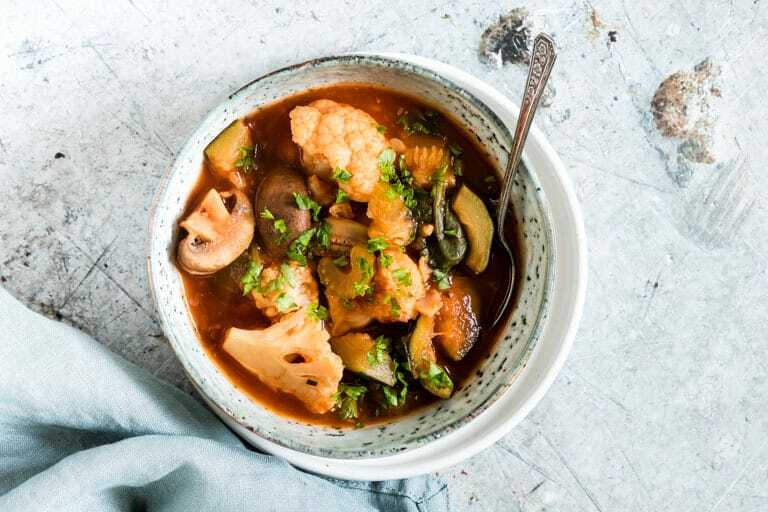 This delicious Instant Pot Detox Soup is brimming with nutritious vegetables and vitamin-packed greens. Plus the mushrooms, ginger and garlic work double duty to add great flavour and help boost your immune system. At the end of a particularly indulgent weekend (or after eating my way through the entire holiday season) I am sooooo ready to cook up lighter, healthful, vegetable-base fare. But even though I crave something healthy, I still want my meals to be hearty and satisfying. And that is why I love this Instant Pot vegetable soup. It is chock full of hearty vegetables that fill me up and keep me going. 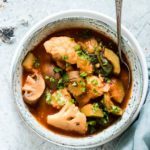 This Instant Pot Detox Soup is free of all oils, and does not contain any rice, noodles or legumes. Which means it is easily digestible and suitable for a wide range of dietary considerations. Plus the Instant Pot makes it super quick and easy to whip up a batch. Yeap, this is one cure-all soup that is destined to become your new favourite soup recipe! 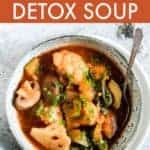 Detox soup is made with nothing but fruit and vegetables chopped into small pieces, which allows your body to easily digest and absorb all of the nutrients. 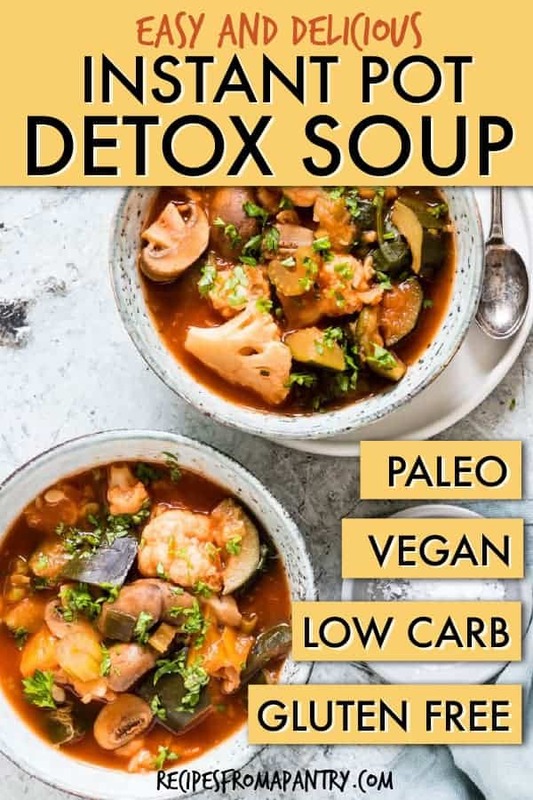 Eating detox soup helps to cleanse the body of toxins that build up from eating processed and refined foods, artificial sweeteners, and other commercially-made foods. 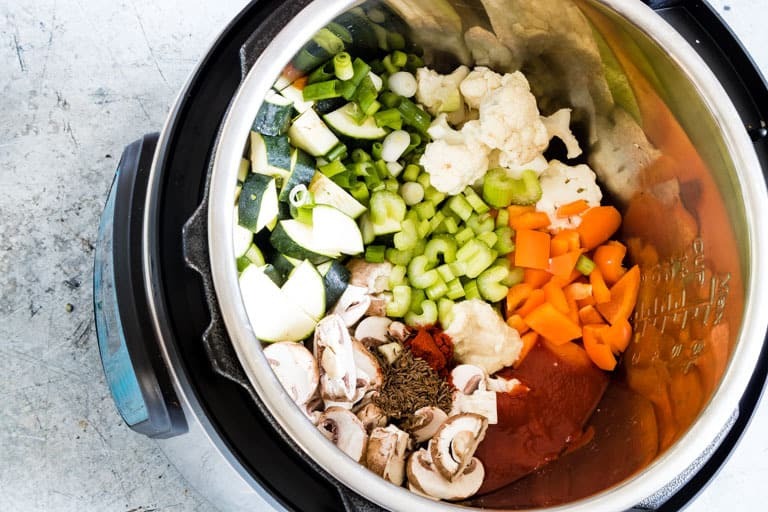 This Instant Pot Detox Soup is suitable for so many diets. 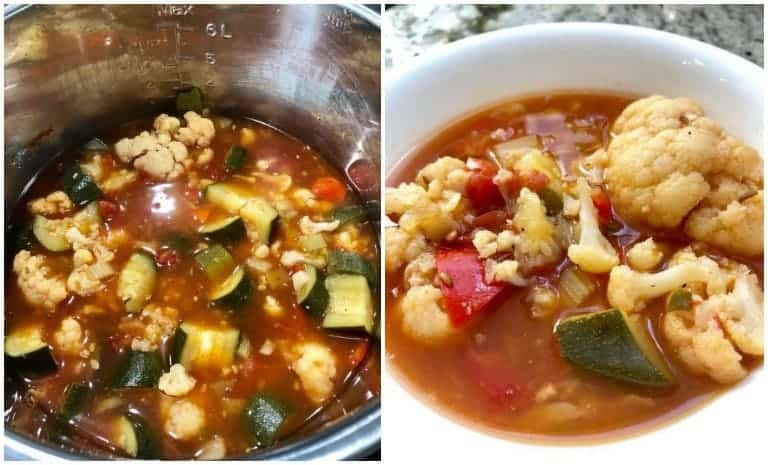 It is a vegan vegetable soup, gluten-free vegetable soup, Paleo vegetable soup, low carb vegetable soup and Weight Watchers vegetable soup. No dietary restrictions? You will love it too. Eating it will make you feel healthy. You can’t go wrong with a soup full of healthy vegetables. Zucchini/courgette, mushrooms, celery, onions, bell pepper, tomatoes and spinach all make an appearance in this soup. It is full of flavour. Detox does not mean a flavourless! 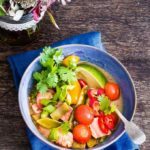 This Instant Pot Detox Soup is so full of favour you won’t even notice that it is good for you. Ready to cook? Gather your ingredients and let me show you……. Step 1. Add all the ingredients to the black pepper into the Instant Pot insert. Step 2. Cover your Instant Pot, set the vent to ‘sealing,’ select the soup button, select high pressure and set the timer to 12 mins. Step 3. When done allow the pot to undergo natural pressure release for 5 mins, switch off, open and stir in the spinach to wilt. The seasonings are up to you. You can swap the caraway seeds for 1 1/2 tsp of Herbes de Provence, Italian seasoning, curry powder or whatever you would like. Cut the veggies into thicker chunks than you normally would so they retain their shape. You can swap out the veggies to your liking. To keep it low carb, swap some of the veggies for cabbage. If you’re not worried about carbs then you can add other veggies to choice. Beans go well too. This is a soupy soup. You eat veggies and you drink the stock – but feel free to reduce the stock by 125 to 250 ml (1/2 to 1 cup) or add a few more veggies. If you want it even soupier then add another 250 ml (1 cup) of stock. Why did I feature zucchini (courgette) in this recipe? Because they are nutritious veggies with a high water content (which will help keep you full) but are low in calories (only 17 calories per 100g). Zucchini also contains vitamin A, vitamin C, potassium and dietary fibre. It is an ideal healthy soup ingredient. To keep your meal low carb, you can serve it with cauliflower ‘rice’ or cauliflower ‘couscous.’ Alternatively, you can stir in cooked shredded chicken, cooked cubed beef, etc. If not worried about carbs, Instant Pot Brown Rice serves as a hearty mix-in. Or you can serve it with bread or crackers. 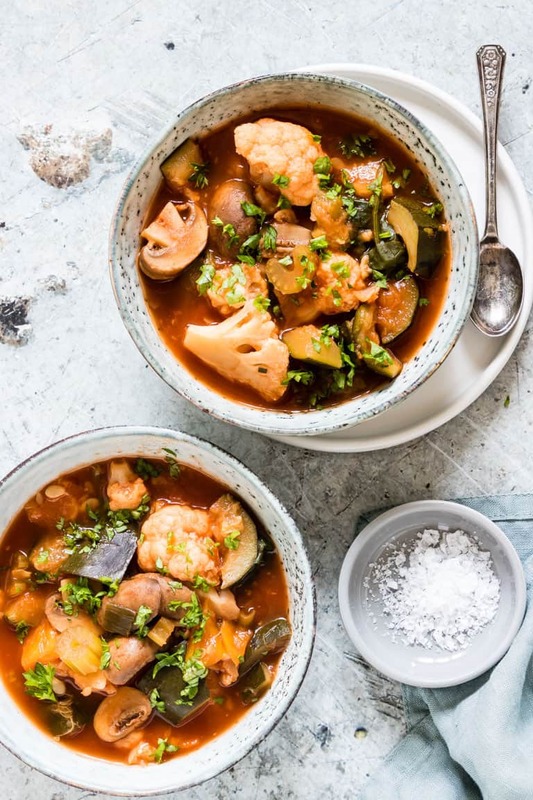 For an alternative soup, why not try this Caponata – Aurbergie Stew or Jamaican Vegetable Soup. 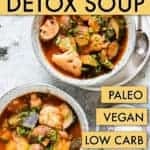 Thanks to the low carb vegetable soup base of this recipe, Instant Pot Detox Soup has 0 Freestyle points. Yeap, 0!! Enjoy a serving of this nutritious soup whenever you would like. This soup will keep in the fridge for several days. Make a big batch at the beginning of the week and then reheat portions for lunch, supper, even a quick snack whenever you need. Wash, chop and slice the ingredients ahead of time and store in the fridge until you are ready to cook. Just keep the veggies in separate airtight containers (especially the mushrooms and tomatoes) to ensure they stay fresh. Even better, you can really get ahead and whip up a batch or two to store in the freezer. Just follow the simple steps below and you can have delicious, healthy soup whenever the mood strikes! Thank you for reading my Instant Pot Detox Soup recipe post. And please visit again as I continue dreaming up recipes, traditional African recipes, African fusion recipes, Sierra Leone recipes, travel plans and much more for you. Thanks for reading Recipes from a Pantry, UK food blog. Don't forget to tag #recipesfromapantry on Instagram or Twitter if you try Instant Pot Detox Soup! It is really, really awesome for me when you make one of my recipes and I'd love to see it. You can also share it on my Facebook page. Please pin this recipe to Pinterest too! Thank you for reading Recipes from a Pantry. 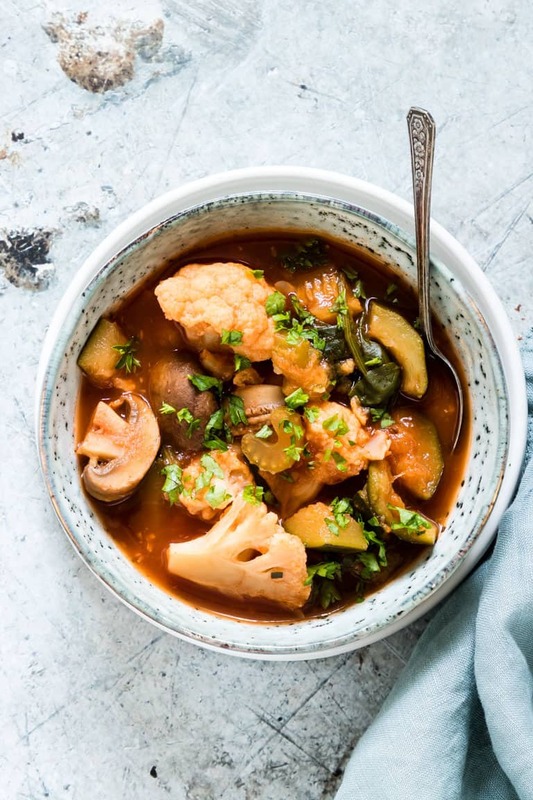 This Instant Pot Detox Soup is hearty and nutritious thanks to healthy greens and veggies. Add all the ingredients to the black pepper into the Instant Pot insert. Cover your Instant Pot, set the vent to 'sealing,' select the soup button, select high pressure and set the timer to 12 mins. When done allow the pot to undergo natural pressure release for 5 mins, switch off, open and stir in the spinach to wilt. Instant Pot Detox Soup has 0 Freestyle points. Yeap, 0!! Enjoy a serving of this nutritious soup whenever you would like. Love my pressure cooker and this low carb soup looks fantastic!! Love how quick and easy the Instant Pot makes stew! The vegetable variety in this recipe is SO good! 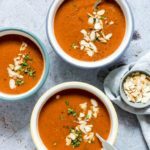 This looks delicious, and so simple in the Instant Pot! I love those big chunks of cauliflower. You’ve used the entire garden in this lovely soup! What a delicious way to keep it healthy this summer. 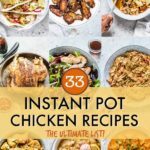 Don’t have an Instant pot, but I suspect I could manage on my stove top! 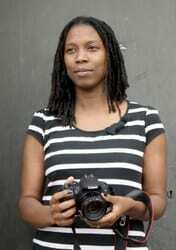 Bintu, thanks a lot for the post.Really thank you! Much obliged.